Director, actor and teacher Roman Stefanski specialises in work for children and has been associated with Polka Theatre since 1980. Susan Elkin caught up with him for a chat. You seem to be extraordinarily busy, Roman? Yes, if there’s a god up there he’s working overtime on my behalf. I’m just back from Sydney where my show Sarah and Duck is playing at the Opera House and touring Australia. 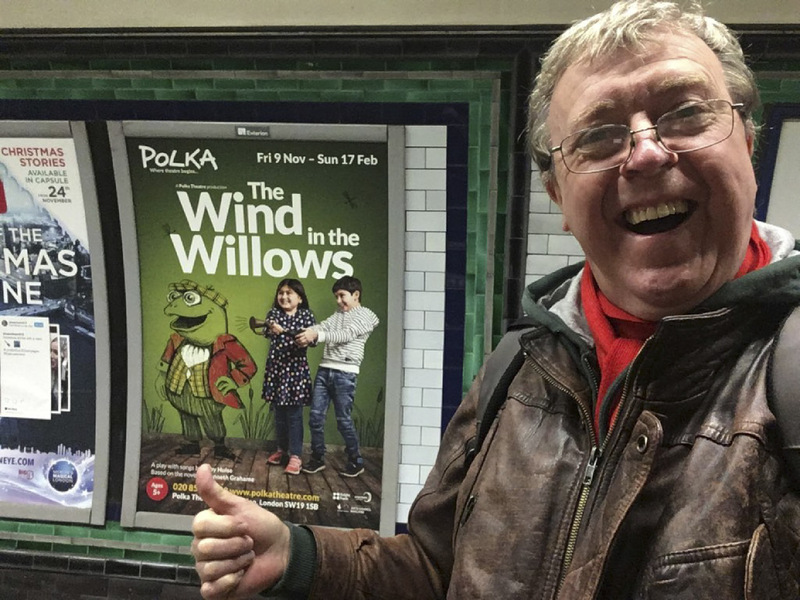 My The Wind in the Willows, running at Polka until Feb 17th – has been well received, I have a show called Properties of Polka touring schools, thanks to Heritage Funding in the spring term of 2019. I’m in charge of the owl in Birmingham Rep’s Awful Auntie at Bloomsbury Theatre and somehow I fit in voice-overs and appearances (I was the honey monster in the Sugar Puffs TV ad) as well as teaching. I have done, and do, it all. I am very lucky. So how did it all start? I was always drawn to acting and I was a member of Questors Theatre as a teenager, but when I left my boys’ grammar school in Ealing I did the sensible parent-pleasing thing and went to Salford University to do Bio-Medical Electrical Engineering. It was a disaster of course. I was hopeless. No aptitude at all. I didn’t even get through the first year. Then, back home with my tail between my legs, I kept walking past Drama Studio London and eventually went in to talk to Peter Clayton the then principal. I got a place, did a great deal of mime and movement along with dance classes elsewhere and well …here I am today! You mention your parents. What’s the provenance of the Polish name? My father was Polish and my mother Swedish. There are lots of colourful skeletons in my family cupboard. She was seduced when she was working as an au pair in a Polish household and you are talking to the result. I also have a sister five years younger. She did ballet while I did acting. I speak a bit of Polish but it’s a very difficult language. I spoke Swedish to my mother at home. The result of this mildly polyglottal upbringing is that I can pick up bits and pieces of other languages fairly easily. I directed my El Mago de Oz (think about it!) in Madrid in Spanish – or Spanglish – for example. How did you first get involved with Polka Theatre? I met my partner Gerald (we’ve been together 42 years!) at DSL and he got an acting job at Polka in 1978. Soon after I got an 18-month contract to perform there and then Richard Gill, who had just acquired the present building for the company which had started in 1967, invited me to try my hand at directing. My first show for Polka as a director was Eskimo Magic. Then soon after we did the Star Dog series and I started working with the lovely Julian Butler who is such a good composer. You were pioneers, weren’t you? Yes, we really were. No one else was doing theatre for the youngest children then, so many industry people simply didn’t get how it works or even that it’s possible. When the National Theatre first decided to try it with The Magic Carpet in the early 1990s they brought Vicky Ireland, Polka’s then director, in as consultant and she had to explain that if you put three-year-olds in the Olivier a long way from the stage they will see very little and quickly lose interest. She suggested they built a four-walled inclusive enclosure on the stage instead – which they did. What do you like most about it? I really enjoy the technical challenges. Working in a low budget, low tech environment means you have to be creatively ingenious and I’m a techie too, so I can talk their language. For example, when we brought water to the Polka stage for the first time we did it simply with a perforated, leaky hose pipe and some sponges and it worked brilliantly as well as coming within budget. I’ve had fun meeting, getting to know and working with authors too. We’ve done adaptations of books by Malorie Blackman, Michael Morpurgo, Philip Pullman and Jacqueline Wilson. So what about Polka’s future? Very encouraging. Peter Glanville, current artistic director comes from a puppetry background (I learned my puppetry at Polka), so I get on very well with him. And over the next eighteen months Polka is, we hope, to undergo a massive £6 million redevelopment. We’ve bought the restaurant next door. The plan is to build a new studio theatre – the Adventure Theatre as we call it – and a new outdoor playground. The entrance will be moved to the side, there will be new toilets and we mean to bring all the creative learning in house. It’s wonderful news that 95% of the funding, including a Mayoral Grant of £1.2 million is now in place. Where do you teach? At several drama schools including ALRA where I sometimes direct shows. I remember you dropped in once when I was rehearsing Candide. I teach at East 15 too and I do masterclasses at Central on their puppetry course. I like passing on what I’ve learned.